Baker’s 1804 Lounge was turned into a winter wonderland Friday night for Ohio University’s Association for Cultural Exchange holiday party. Okay, not really — it’s difficult to have a winter wonderland without snow, although there was an ample amount outside. But there was plenty of festive cheer, complete with ugly sweaters and all. ACE’s events, which are generally three to four times a semester, are geared towards encouraging interaction between the local and international community. 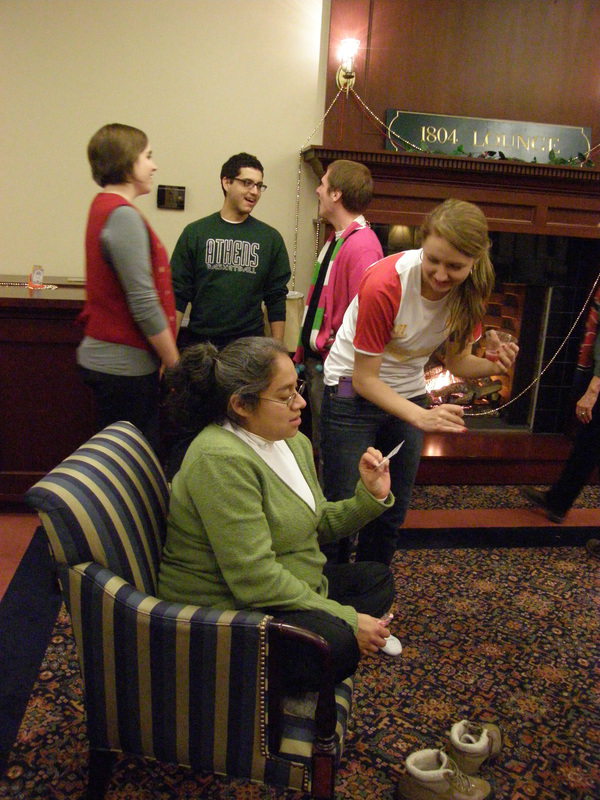 Junior global studies major Liby Forbes talks to Liana Flores as the Winter Wonderland party winds down. “We do lots of parties like this one, events that are about American culture and we try and get those two sides of the the community to meet up because they usually don’t,” said Amanda Tragert, vice president of ACE. At Friday’s party, according to ACE President Samantha Smith, between 20 and 25 people attended throughout the night. About half were international and half were local, which is abnormal, compared to their typical turnout of a majority of international students. Tragert added that another reason international students make up the majority of attendees is because they are generally just more interested in the international events at OU. “It’s a smaller community…and they’re already tuned into everything international that’s going on,” Tragert said. One of the positive effects of ACE events like the holiday party is that people get to learn about differences between cultures. For example, earlier this year ACE held a pumpkin carving event — something that international students may not be familiar with even though it is a standard in the U.S. Next semester the organization will hold one of their only international events, sushi making. Getting involved with other cultures is something that freshman ACE member Maddy Hayes, an East Asian Studies major, values highly. Next semester, ACE will (tentatively) meet Thurs. at 7:00 pm in Baker 226.